The philosophy at The Royal Elephant is to provide authentic Thai food at value for money prices, backed up by service that is both relaxed and friendly. The restaurant is attractively decorated and has exposed brickwork and beams, cosy corners and alcoves and well spaced tables. Our long-established sister restaurant is also The Royal Elephant in Potters Bar, offering the same menu in very comfortable surroundings and proud of its reputation for quality and service. The newly opened restaurant in Beaconsfield follows the same tradition of quality and service. All Royal Elephants are the perfect locations for business or family get-togethers. Visit www.theroyalelephant.co.uk to view our sister restaurants in Potters Bar and Beaconsfield. The menu includes traditional Thai dishes as well as some unusual and original dishes and an excellent range of fish and seafood and vegetarian. Some of the Chef�s recommendations include Neur Ga-Ta � sizzling sirloin steak marinated in spicy sauce and served in a hot pan and Hor-Mok Kha Nom Khrog � seafood souffl�, steamed mixed seafood blended with curry paste, kaffir lime leaves, sweet basil and Chinese leaves, served in a special clay plate. 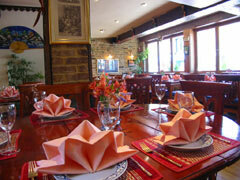 Both Hampton Hill and Potters Bar restaurants take great pride in producing genuine, original Thai cuisine. Within the Potters Bar restaurant, on every Wednesday you will be treated to a display of traditional Thai dancing featuring both the Chawa followed by the Phu Thai dance. We strongly recommend that you try The Royal Elephant Banquet with its selection of dishes to share and enjoy. The Royal Elephant�s sister restaurant can be found at 10/10A High Street, Potters Bar Herts EN6 5AF, tel: 01707 660668. Open every day noon-3pm and 6pm-11pm. All major credit cards accepted (not Diners). No service charge.